Marco Vista waterfront condos are close to so many different Marco Island amenities and epitomize island living. 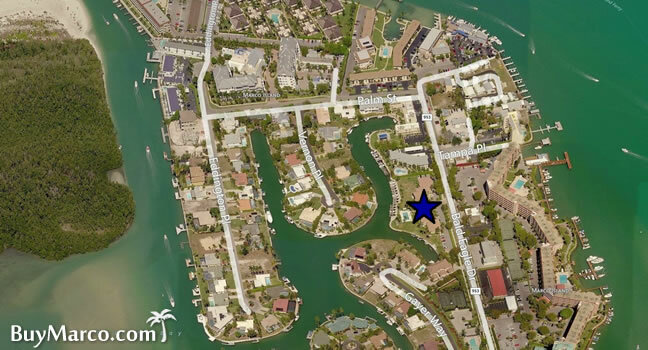 Located directly across from another favorite boating condo, Riverside Club, Marco Vista is in quaint Old Marco section of the island. The famous Snook Inn is just a block or so down the street if you get hungry for a Grouper sandwich or a beer. The Gulf of Mexico is just a few minutes away by boat in order for you to go catch said Grouper. Each home contains plenty of space with average measurements of 1,100+. The affordable price tag is also very inviting. Close to the boat docks, even an avid angler or recreational boater will enjoy living in these spacious homes. After a fun day out on the open sea, Marco Vista makes a for a great place to relax. With its views of the water, palm trees, and salty ocean winds blowing in, everyone is sure to enjoy living here in the Marco Island area. There is no need to suffer through a harsh snowy winter again when you see what these units have to offer. You can enjoy scintillating water views from your own updated space complete with ample storage and modern amenities like new carpeting and renovated kitchens. Living in the Marco Vista community means that enjoying all the bountiful shopping, glamour, and culture that Marco Island has to offer. The monthly maintenance fee for Marco Vista condos is $432. That's pretty reasonable considering what's included. Expenses like master insurance, cable TV, lawn maintenance, landscaping, manager, trash removal and water & sewer add up. Plus, the exterior maintenance of any waterfront property is never cheap. While pets aren't allowed here, they are permitted in plenty of other Marco Island condos. The one's that are pet friendly are listed in our exclusive Condo Comparison© charts. The minimum rental period in Marco Vista is 30 days. Like all Marco Island waterfront condos, Marco Vista condos are very easy to rent all season long. The short boat ride to the Gulf is just what Snowbird boaters are looking for. Marco Vista offers only one two-bedroom floor plan, keeping it simple. The horseshoe-shaped development makes for great views of the boats and pool. Click here to see all Marco Vista floor plans.